Some of the beneficiaries relax in their wheelchairs. Courtesy photo. 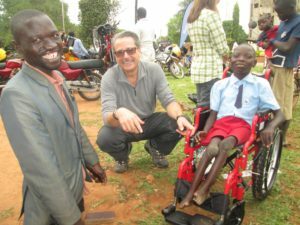 GULU: Rotary Club Nsambya Kampala in partnership with Rotary Club Gulu yesterday donated 100 wheelchairs as relief aid to Persons with Disability (PwD) in Acholi sub-region. The donation according to Mike Kironde, the president of Rotary Club Nsambya, aimed at aiding mobility and improving livelihoods of PwDs in a region that was plagued by civil war for close to two decades. 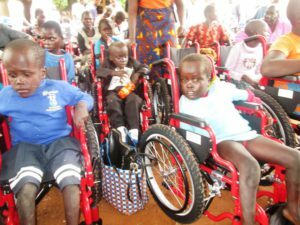 While speaking at the handover of the wheelchairs at the Gulu District Council Hall, Kironde urged beneficiaries to make good of the wheelchairs valued at Shs850,000 each. Deogratius Okello, 31, an Information and Communication Technology specialist and resident of Gulu town, commended Rotary Club for the good gesture. Rotarian handover a wheelchair to one of the beneficiaries. “I thank Rotary Club for the donation because it will help ease my movement,” Okello said. He slammed politicians for interfering with the programme meant to benefit PwDs, urging that PWDs are always denied access to government development programmes. Joyce Auma, 26, member of advocacy team for Center for Women in Governance (CEWIGO) network in Gulu, lauded Rotary Club for the wheelchairs, noting that the wheelchairs will help reduce expenditure on hiring boda bodas. She appealed to the Rotarians to also consider persons with eye and ear disabilities and avoid focusing only on the crippled persons. Auma also urged Rotarians to extend credit facilities such as loans to PwDs to enable them become self-reliant. Beneficiaries listen to a speech from the rotarians. Gladys Lakica, 7, resident of Patiko sub-county in Gulu District, said the donation will enable her go to church. The young girl said she always remained home whenever her sibling went to school and church. Lakica’s father Charles Odong, a boda boda man in the area, said his daughter was born normal but got paralysed after she developed a head tumor at age of 3 months. Santa Akot, a disabled mother of four and a widow who lost her husband in 2000 during the LRA insurgency, said fending for the family has been a challenge since her husband passed on. The petty trader in Atiak trading centre has always struggled to raise school fees for her children. To her, getting a wheelchair was a dream come true and she hopes to do more to help raise her children. “Mobility has always been a problem. I move in mud whenever it rains and this has been causing me a lot of pain since my condition is allergic to coldness. With a wheelchair, I will do my business better,” Ajok said. Like several other disabled persons, this is Ajok’s first wheelchair since childhood. Kironde said they have started with northern Uganda because the area was devastated by war, polio and other calamities. 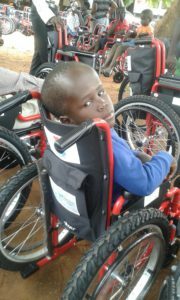 A child beneficiary in his wheelchair. He said that as a Rotarian, he feels happy seeing people’s lives being transformed. “This morning, I met a 65-year-old man who has never walked but he is now a proud owner of a wheelchair,” Kironde said. He cautioned the public against stigmatizing PwDs, adding that PwDs have got potential and once supported can significantly contribute to the development of the country. Sam Komakech, the Gulu District Community Development Officer, said it’s hard for persons with disabilities to benefit from government programmes if they want to be supported in isolation. He urged PwDs to always attend community development meetings and voice their views for consideration during decision making. The 100 wheelchairs were given to beneficiaries from Agago, Amuru, Nwoya, Gulu, Lamwo, Kitgum, Omoro and Pader districts.